Recently I have had the pleasure and delight to meet some absolutely STELLAR beauty bloggers!! We have so much in common, and you have been so encouraging and supportive- I've found some great friends, and what feels like SISTERS. You ladies seriously make my day. I love having your company present through Twitter, Facebook, Blogger, etc. You have no idea how it helps me get through my torturous workdays. You really are bursts of pure sunlight to me. 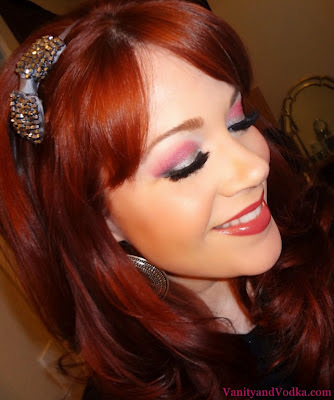 Well one of those very special sisters, Marina from mCubedMakeup, asked me to do a look using bright pink and silver. So this is for her. For this look, first I took care of my foundation, powder, and brows. Then I primed my lids with UDPP. Next I applied Nyx Jumbo Pencil in Milk on the lid itself to create a tacky surface. Then picking some bright pinks from my Coastal Scents 252 Palette, I started blending them into my crease and up and out to soften harsh edges. I used a soft vanilla shadow for my brow highlighter shade. 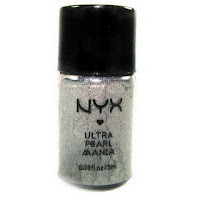 For the silver I used Nyx Metal Mania Loose Powder in Silver Pearl. You'll notice I did some contouring in the outer V and corners with black shadow to add some depth. Then I lined my eyes, applied mascara, and popped on some Red Cherry Lashes (#62). Lips: Nyx Round Lipstick in Doll, and Doll Pink Gloss. Thanks again to all my ladies. You're very special and I thank you for making me smile. Omg this has to be one of my favorite looks so far. Love the lashes too. Thank you thank you!! I'm thrilled you love it! YOU'RE GORGEOUS!!!! the makeup looks awesome and your hair color is AMAZING!!! Niki you are too sweet!!! Thank you so much!! ha ha!!! OK!! Deal!! Anything for my WyoSparkles girls!! This is a very cute look! Love the silver shadow! Gorgeous look, you have the prettiest hair by the way! I looove your eye make-up ! Hey doll, i am on vacation as well, so no prob, i knew you would answer back whenever ;). I wil def check the sites out, thanks alot. And once again you've created a wonderful look! Love it! I freaking love the crap out of you! I feel so special x100000000!!!! This look is amazing, I am totally trying it out this week! Love yoooooooou!!!! SWEET!! Glad you love it!! :-) MWAH!! Very true! And thank you!! Its blended perfectly! Excellent job! Incase youre interested, Im having a giveaway on my blog too! Thank you!! Absolutely!! Hello to Pakistan!! You are gorgeous and this look is so fun! That's awesome you interact with your followers so much:) I am now following too. All the looks you do are so pretty! Aww!!! Thank you Heather!! That is very sweet of you to say! Love all your looks! Just came accross your blog and love it. New follower. Absolutely will do!! Thank you so much, Laura! Aww Donna! You are always so sweet! Thank you so much!! Of Course, Marco! your blog is STUNNING!! Gorgeous fashion! i ADORE the pink and silver combo! ur beautiful! love all of your makeup looks! Omg girl, this looks beautiful! Love it!